Need an inexpensive helmet that has the same safety certifications as the big boys? Look no further than the Bell Vortex. This helmet has been on the block for a while and is always a popular option for those searching for a safe first helmet or a helmet for the occasional passenger. The 2014 graphics make this perennial favorite look brand new again. The Band graphics in either Black and Orange or White and Blue would look equally at home on either your head or on the side of your crazy uncle’s 1978 custom van. Designed in Bell’s Santa Cruz studio, these graphics represent that California Soul that’s guaranteed to warm your engines whether you’re cruising down the PCH or just hitting your favorite local roads. Make sure you bring your shades because when you get where you’re going, you won’t look nearly as cool after you take the Bell Vortex Band Helmet off. The Manifest graphic is Bell’s take on the increasingly trendy Hi-Viz color. Get noticed! This electric graphic comes fully-charged. The Hi-Viz Yellow is offset with black details to make the Hi-Viz really spark. This graphic was made for sport riders who prefer not getting run over by inattentive drivers. 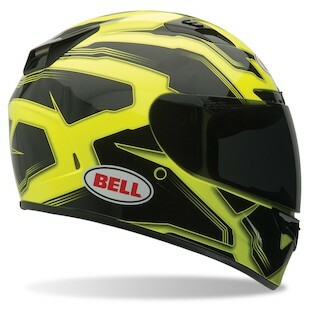 The Bell Vortex Manifest Helmet is bright enough to shock anyone’s retinas into observing the rider wearing it. The Rally graphic is Bell’s take on the classic rally stripe. 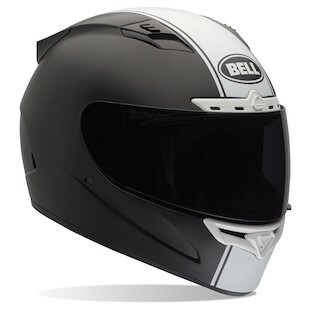 We have seen this Matte Black and White combo before on the Bell Star and now they’ve introduced it on the Vortex, reiterating the fact that this helmet is just a less expensive version of Bell’s race-ready helmets. This graphic is subtle and tasteful but definitely not dull and boring. Is it a simple design in a world increasingly complex patterns? Is it a modern take on an old-school style? 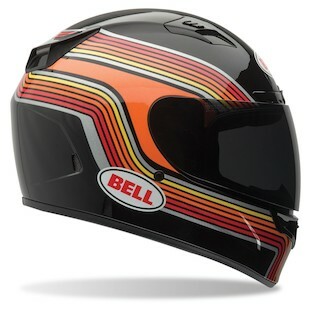 We think the Bell Vortex Rally Helmet checks all of these boxes quite tastefully. Bell’s new 2014 lineup of graphics for the Vortex helmet has something for everyone. It isn’t the latest high-tech release from an ultra-expensive brand but it offers SNELL certification at an entry level price and has been a rock solid option for a while now.